Stained glass has helped to add a refined sense of beauty and color to homes, businesses, and other spaces for hundreds of years. Help illuminate your entryways with a beautiful new stained glass front door. 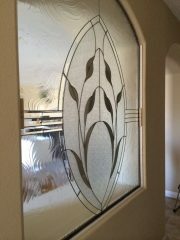 At Entry Brite, we offer custom doors that are inlaid with the finest quality stained glass available. 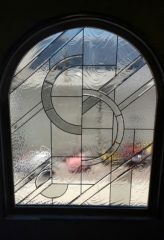 We are more than just home remodelers, we are artisans, and that commitment and passion for artistry is evident in every one of our custom stained glass pieces. Your visitors will be in awe of your stylish stained glass and wrought iron front door. Entry Brite offers its artisan skills to the communities of Phoenix and Tucson, Arizona as well as Las Vegas and Palm Springs, Nevada.